The fact remains: Windows 7 is the most widely-used Windows version. It is running on over 40 percent of Windows computers worldwide – above all in companies. AV-TEST examined 12 enterprise solutions in terms of how well they protect their Windows 7 clients. 12 products put to the test (photo: pixabay.com). Generally, companies are not quick to migrate to a new Windows version. It is a fact that Microsoft has now realized as well. Although Windows 10 was partly even given away to companies for a whole year, most companies stuck to the Windows version they were using. Thus, among all Windows versions, Windows 7 remains the most widely-distributed system in the world, with usage of over 40 percent. 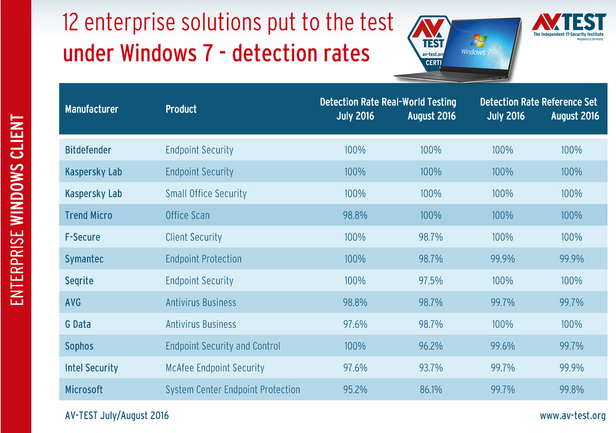 That is why the Windows 7 clients of 12 enterprise protection solutions were examined in the lab at AV-TEST. The test ran over two separate test months – July and August 2016. The three test categories, protection, performance and usability, were each examined twice. Along with the security certificate, as many as four products additionally earned the designation as "TOP Product": Bitdefender, Trend Micro and the two solutions from Kaspersky Lab; Small Office Security and Endpoint Security. This recognition is only reserved to solutions that achieve the highest point score of 18 or at least 17.5 points in the test. All the products that followed attained a good score of 15.5 to 17. Only the solution from Microsoft reached a mere 14 points. A total of four security packages for corporate users garnered recognition as a TOP product. This is the most difficult hurdle in the test, which was overcome absolutely flawlessly by a total of 3 products. The solution achieved the maximum score of 18 points in the July/August test. 18 points in the test – this is the highest result a solution can achieve in the AV-TEST lab. The solution for smaller companies always achieved 100 percent in the detection test. The detection test helps to determine protection effectiveness. In fact, in the real-world test, the challenge was to detect and remove 160 new malware specimens. In the further test with the reference set, the requirement was to filter out and remove 15,000 already known, yet particularly nasty malware specimens. This test run was carried out with all the solutions once in July and once in August. Throughout all the test steps, Bitdefender and Kaspersky Lab with its two versions consistently achieved 100-percent detection rates. With the smallest errors, the products of Trend Micro and F-Secure followed close behind. While the packages coming in next in the four individual tests did in fact repeatedly achieve top ratings, yet some lower results were also in the mix. 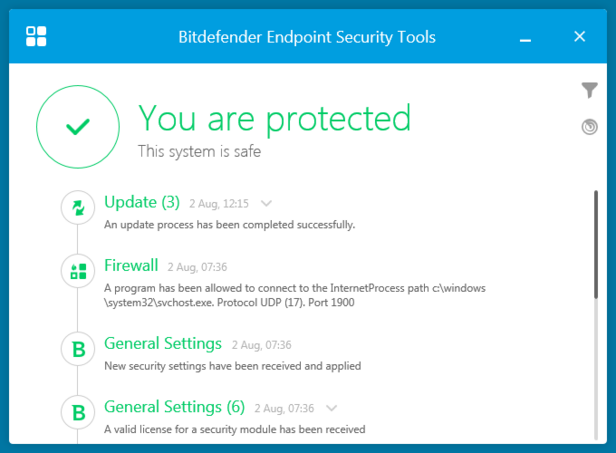 The free security module from Microsoft had the most problems in detection of the latest threats in August, thus earning the lowest score of 86.1 percent. In companies, work PCs are often used over a longer period of time than consumer PCs. That is why - in the category of performance - it plays a major role just how much of a load the protection client puts on work PCs. For better comparison, the lab uses a simple standard PC and a high-end PC in the test. Each product is installed on the machines and required to complete the following tests: visit popular websites, download, install and launch programs, and copy data packages over 7,500 times. All tests were performed twice and all the numbers collated. 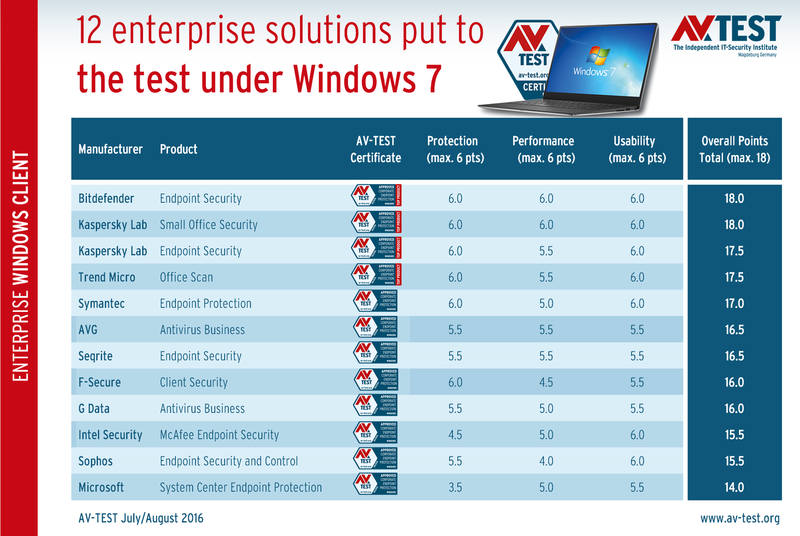 The result is quite impressive: the clients of Bitdefender and Kaspersky Lab Small Office Security achieved the best point score of 6 for the lowest system load. 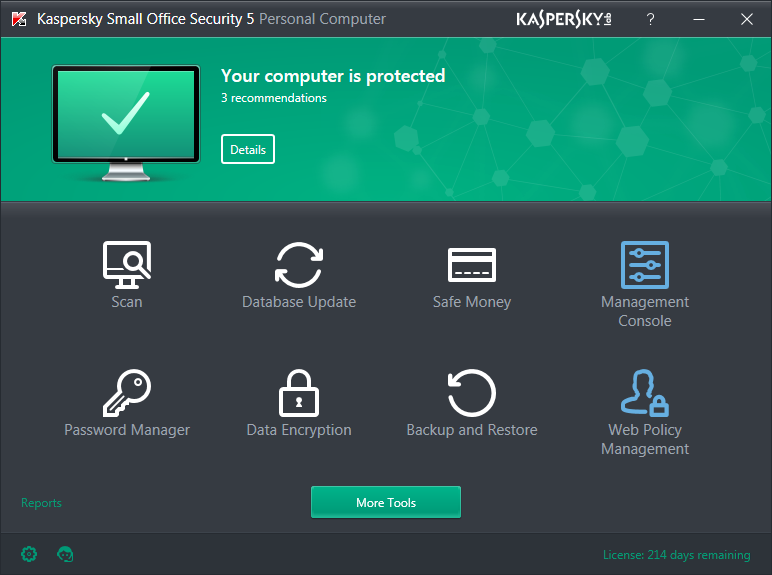 The products from Kaspersky Lab (Endpoint Security), Trend Micro, AVG, Seqrite, Symantec, G Data and Intel Security (formerly McAfee) and Microsoft still attained a good 5 to 5.5 points for a very low load on the client. Only the clients from F-Secure and Sophos created too high a system load for the testers. As result, these packages earned only 4.5 and 4 points respectively. There is a finite number of support staff or administrators in companies. For that reason, a heavy number of false positives or blocked programs triggered by the client translate into increased support overhead in the company. In order to test how well the clients of the solutions are working here, there is the testing category of usability. This includes: blocking of websites, false positives due to incorrectly-detected files and the false detection of clean software when launching or installing programs. That is why all products were required to go through the following procedures: visiting 500 clean websites, scanning over 1.3 million harmless files and installing and launching over 40 popular applications. The whole procedure was naturally repeated once in July and in August. This test segment turned out especially favorably for the solutions from Bitdefender, Kaspersky Lab (both test versions), Trend Micro, Symantec, Intel Security (formerly McAfee) and Sophos. The testers rewarded these products the maximum 6 points. Throughout all the tests, all other clients warned or blocked a maximum of 4 to 10 cases and, as a result, still received a well-deserved 5.5 points. If we look strictly at the protection function of the solutions, a total of six of the products tested are particularly recommended for use since they earned 6 points each. An additional four still received an excellent point score of 5.5. 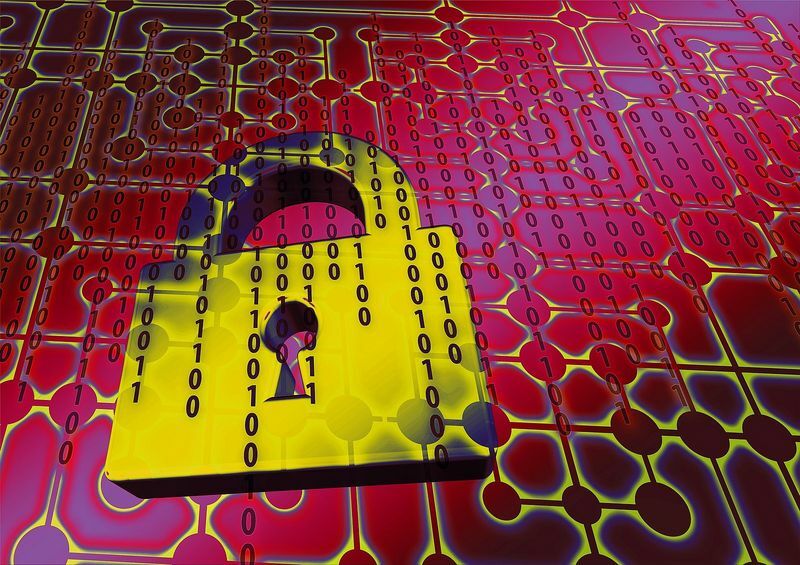 Many of the solutions for enterprise users are a secure bank against attacks. But for companies, it is not only about security alone. The system load on the client and whether a solution causes many false positives can be a later cost factor. With the maximum achievable point score of 18, only the products Bitdefender Endpoint Security and Kaspersky Small Office Security achieved this score. Yet the following products also delivered top scores of 17.5 in the test. They are Kaspersky Lab Endpoint Security and Trend Micro Office Scan. Some managers keep the budgets for security in companies as low as possible. Up until the day when the worst-case scenario occurs. Then the budget is suddenly without limits. Each year, international studies use surveys to gather information from companies on how much money they have lost on average through outside attacks. A current study from Kaspersky Lab states that major companies lost 860,000 dollars per attack. Medium-sized companies are estimated to have lost about 86,500 dollars per attack (here is the PDF download). 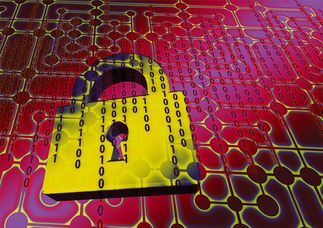 Depending upon how a company is positioned, even one single cyberattack can wipe out the company's livelihood. The long-term consequences of the attacks are not even mentioned in the study. Thus, companies can still retroactively lose customers because they are perhaps required to admit to the data loss of a project. In companies, the decision concerning the procurement or expansion of a security solution should never be a question of money. The risk is simply too large. In the study by Kaspersky Lab, 4,395 professionals and executives in small, medium-sized and large companies from 25 countries revealed that they had been attacked. 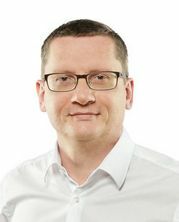 With a reasonable investment and an annual budget, companies can ensure that they will perhaps never be within the target group for such studies.